Fiction – paperback; Harper Perennial; 298 pages; 2004. Take a look at Hilary Mantel’s back catalogue and I defy you to name another living British author with such a diverse range of subjects and genres under his or her belt. I’ve only read two of Mantel’s books — the delicious black comedy Beyond Black and her critically acclaimed memoir Giving up the Ghost — but have been keen to explore more of her work. Eight Months in Ghazzah Street, originally published in 1988, came much recommended by visitors to this blog. It turned out to be a superb, insidiously creepy read, the kind of story that gets under the skin and has you throwing glances over your shoulder to make sure no one’s watching you. It’s set in Saudi Arabia, a highly secretive and repressive society, where the religious police keep a close watch on everything, there are strict laws about what you can wear in public and women are not allowed to drive. Into this restrictive and claustrophobic world come British expats Frances and Andrew Shore. Andrew, an engineer, has a job working for a private construction company in Jeddah. Frances, a cartographer, is forbidden from working, because of her gender, so she must spend her days “keeping house”. Despite the fact that both are used to strange cultures — they lived in Zambia, where poverty, violence and corruption went hand in hand, for many years — Frances is immediately uncomfortable in her new surroundings. Instead of living in an expat compound, they’ve chosen to live among the natives, in an apartment block in a quiet neighbourhood. But everything is walled in and even one of the doorways has been bricked up, creating a cavern-like abode rarely penetrated by daylight. With not much else to do, Frances befriends the Muslim women living in the building and finds herself unable to come to terms with the religious and cultural differences between them. She finds a similar discord with the expatriate community in which she is expected to socialise. Before long paranoia takes ahold. Knowing that the apartment above her is empty, Frances begins to hear unexplained noises — a woman sobbing, footsteps and furniture moving around. When she sees a strange presence in the apartment block’s stairwell, she’s convinced that something illegal is going on, but no one, including her husband, believes her when she voices her concerns. Perhaps she’s going stir crazy after all? Eight Months on Ghazzah Street is a psychological thriller of the finest order. It reads like a woman on the verge of a nervous breakdown, but because Frances is an intelligent worldy-wise woman, you know that her fears aren’t fickle. Mantel builds up the tension slowly but surely, revealing Frances’ increasing sense of foreboding through diary entries that are interspersed throughout the third-person narrative. It’s a highly effective device. 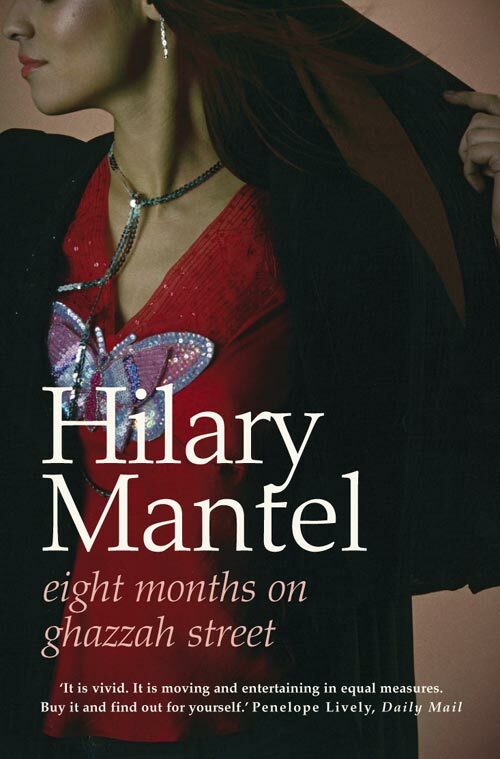 I loved Mantel’s memoir Giving Up The Ghost and I have Wolf Hall to read but you’ve just gone and made me want to read this book first – right now, in fact. Sounds like a good book for book group discussion. Hi Samantha! Yes, this would make a great book group book as there’s so much to discuss here. Frances really can’t under the women who live behind the veil, and yet the women who wear the veil actually like wearing it. That, in itself, would make a great discussion. It became clear upon reading this that Frances was imposing her Western views on these women, and yet these women were trying to impose their eastern views on her. I think Hilary Mantel is one of the best British writers of my generation. I’ve read all her books, and they are all wonderfully well written, and as you say, so diverse in subject matter. Her novel about the French Revolution, ‘A Place of Greater Safety’ is an absolute masterpiece, and helped me to understand how frightening and volatile societies are during a period of revolution. At the moment I’m about two thirds of the way through ‘Wolf Hall’ and am starting to read more and more slowly as I don’t want to get to the end! This really deserves to win the Booker Prize. I’ve just borrowed “Vacant Possession” at the library as my first Mantel book, inspired by this FIVE-STAR-review. I am a bit turned off by the fact that some of her works (incl. “Vacant..”) are noted for their great humour — I don’t really like literature that tries too hard to be funny… I prefer serious stuff with some funny moments, Amazon reviews mentions “laugh yourself silly” … simply doesn’t sound like my kind of book. But on the other hand, Mantel seems to have tackled more serious subject matters as well. Here is another extremely positive review of Hilary Mantel’s “Wolf Hall”, calling her the “finest underappreciated writer”. Thanks for the link, Tony. That’s a great review. I’m looking forward to reading Wolf Hall but will wait for the paperback release, I think. I don’t think you’ll find her books are obviously ha-ha funny, but have moments of black humour in them, such as Beyond Black. Any writer trying too hard to make readers laugh is, I agree, a bit of a turn-off. So, what did you think of The Shiralee? Hope you liked it. It’s a brilliant book, isn’t it? Honestly, I raced through it in a matter of days. My sister lives in Abu Dhabi and her husband works in construction, so it rang a few familiar bells for me! I’ve told my sister she MUST read this one, but I doubt she’ll find it for sale over there, I should suspect it’s probably on the UAE’s banned books list! You have me itching tot read A Place of Greater Safety now! I haven’t read Wolf Hall, but I’d be delighted if she won the Booker, if only to recognise her brilliant writing career. It reminded me a bit of Steinbeck’s great classic “Of Mice And Men” — the search for occasional farm work, traveling with a burden (in Macauley’s case a small child, in Mice+Men a slightly retarded large child). Phew. Glad I didn’t give you a bum steer on that one! Yes, it reminds me of Mice and Men too, I just hadn’t realised it until you mentioned it. Never read Sharpe or Lodge so can’t really comment. Now THIS is a writer I really must read soon…which of hers do you recommend starting with? I’m probably not the best person to ask, as I have only read two novels and her memoir. I’ve enjoyed them all. I think after having read Wolf Hall and just totally and utterly loving it, it could be in the run for my book of the year, Mantel is someone I now need to really get more reading time with and this one sounds perfect, especially as you gave it a whoping 5 stars! Yes this is most definately going on the wishlist! I haven’t read Wolf Hall, but from what I can tell Eight Months on Ghazzah Street is COMPLETELY different in so many ways, so whether you like it as much as me will remain to be seen. I’m now tracking down her back catalogue, as I plan on reading the complete set. I think she’s brilliant. I have never heard of this author but I so want to read this book after this excellent review. It is on my short list. Thanks!! I am definitely going to become a regular reader of yours! I have a “reviews by setting” bit in the menu, down there on the right, which might help. But I really am not that well read when it comes to “world literature”. Best of luck with your venture. Sounds like an intriguing challenge. I would like to thank you for the review of this book. If it wasn’t for this review I would have easily overlooked this unique and intriguing book. Thanks, akuma. It is one of those books that has slipped under the radar, so to speak, but it is deserving of a wider audience.